The idea behind this game is so simple that it is difficult to believe that no-one has ever thought of it before - basically that students move around the board answering questions about English and the occasional general knowledge question and get points (coloured counters) for it. In fact, I've worked in two schools where teachers had tried to produce such a game, but if you are going to convince your students that answering grammar questions is a game then presentation is everything. 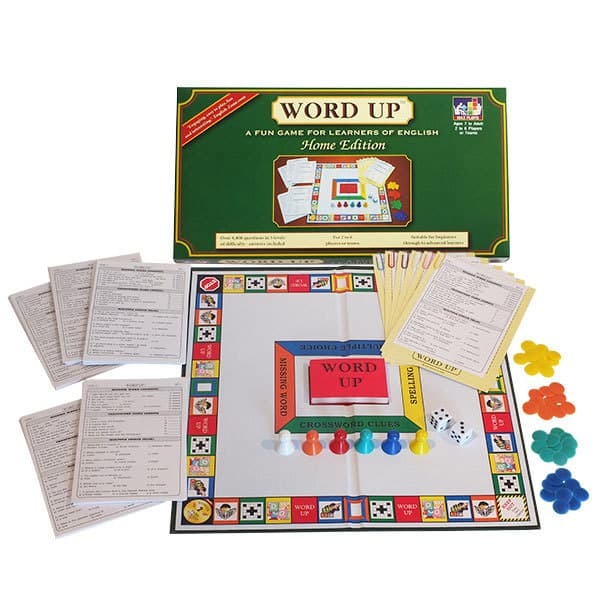 "Word Up" wins on presentation right from when you open the box, from the board which looks just like a proper Monopoly board and the proper plastic counters, to little details like the cards for students to put their question sheets on and the pretty little paperclips for them to do it with. 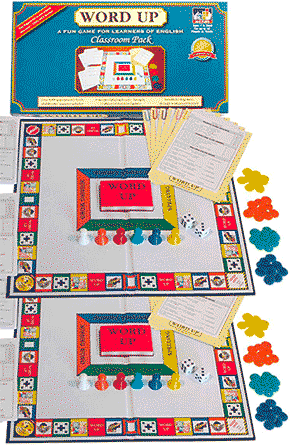 As well as the things mentioned above, the game included two dice, little plastic "men" to move around the board, 160 question sheets in 5 different levels with 7 questions from each category on each, and instruction booklets with "Instructions for Teachers" and "Rules of Play". The rules of the game are that students roll the dice and move around the board. They must then answer a question from one of 4 categories depending on the colour they landed on. The 4 categories are: Missing Word (orange), Crossword Clues (green), Multiple Choice (blue) and Spelling (yellow). If students get the question right they get a counter of that colour and continue playing. If not, play passes to the next student. The first person to get two counters of each colour wins. The main variation to this routine is when students land on the "Word Up" square and take a "Word Up" card. Like "Chance" cards in Monopoly, students can be lucky enough to gain two counters, or at the other extreme unlucky enough to lose two. There are also squares on the board with similar benefits and penalties. The Missing Word category of questions is mainly a test of collocation, such as fixed expressions and dependent prepositions, with some grammar. The students are helped a little by being given the number of letters of the missing word. The Crossword Clues are a test of vocabulary such as opposites, with the first letter given. The Multiple Choice is a mixture of general knowledge and vocabulary. The good thing about the Spelling Questions is that the word being tested is given in context in a sentence. The 5 levels are aimed at levels from Elementary to Advanced, but as they mainly test vocabulary it can be a little difficult to judge which of the levels will suit your class best before starting play. This can be quickly solved by swapping cards for a higher level during play, often without the students even noticing that they have changed level. Alternatively, this tactic can be used to stop a runaway winner, or with mixed-ability classes. I must say that before using the game I was a little dubious as to whether I could convince my adult students that rolling dice could suddenly make English fun. I was also a bit worried that my teenage class would react negatively to being asked to play a game. In fact, I was worrying about nothing. All the students in the school who tried it (and that has literally been nearly all the students in the school when word got around) loved it. Some even asked where they could buy it so they could play it at home. And some teachers played it with one-to-one students, with the student asking the teacher the Level 5 questions. All in all, the biggest hit in our school this year. 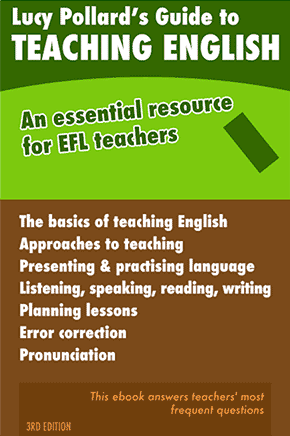 My only little quibble would be that it takes a good 10 to 15 minutes to read through and understand the complete rules and guidelines for teachers, and while they certainly cover every possible eventuality there could perhaps have been a "getting started quickly" guide, with teachers only referring to the full version when student queries come up. Reviewed by Alex Case, who has worked as a teacher, teacher trainer and Director of Studies in Turkey, Thailand, Spain, UK and Japan; and runs the TEFLtastic blog.